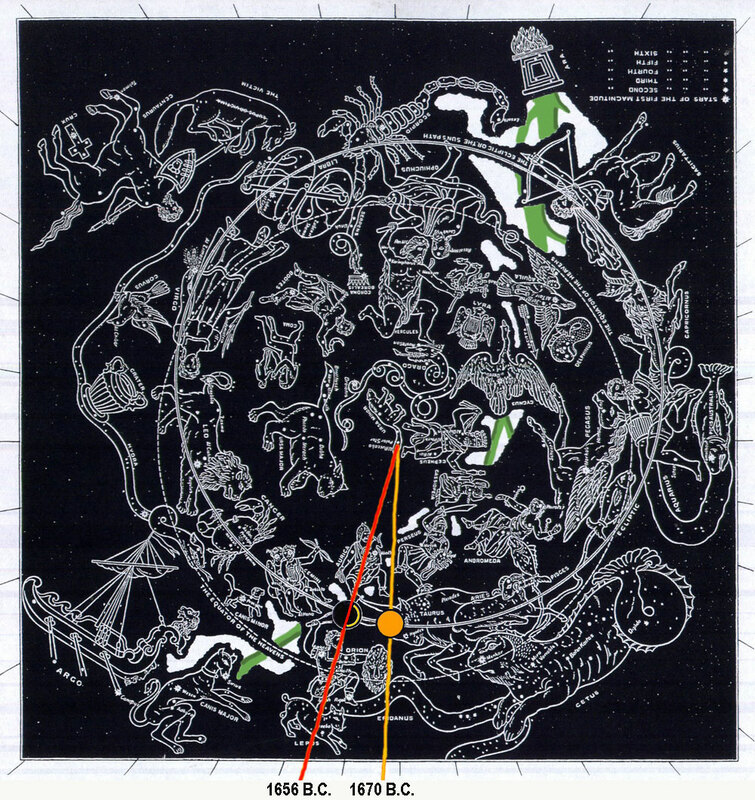 Genesis chapter 41 Star Chart: Using the degree-day scale, seven years are seven laps around the Zodiac from solar golden Taurus. These cows progressively graze nearer and nearer the Milky Way River. The lunar crescent is first visible at 7° from the the sun. Then seven more laps around the Zodiac till we arrive at the two-horned crescent black moon. These seven laps passing through Taurus turn one cow into seven. Seven more laps of the two-horned crescent moon turn one two-horned crescent black cow into seven. The same is true for one ear of each type of corn (grain). It turns into seven for each. Notice the (solar golden) ear of grain with (yellow radius) stem is encountered once per lap, so seven laps are seven (solar golden) ears of grain. Then seven more (lunar empty) ears of grain with (red radius) stems occur, blighted by the hot (Milky Way) east wind. From 1670 B.C. till 1656 B.C. is 14 years after 14 laps. Clockwise from when Pharaoh (Orion) "stood by the river" (Eridanus) (41:1) and "seven well favoured (Taurus) kine and fatfleshed" (seven 360° revolutions of the solar golden sun in Taurus) "fed in a (green Milky Way) meadow" commencing in 1670 B.C. till "seven other (Taurus) kine came up (7°) after them out of the river (Eridanus), ill favoured and leanfleshed (seven 360° revolutions of the two-horned crescent black moon to Taurus); and stood by the other kine upon the brink of the (green Milky Way) river" (41:3) and (lunar open mouth) ate them up (41:4) in 1656 B.C. is 14° years. Clockwise from when "seven (solar golden) ears of corn (grain) came up upon one (yellow radius) stalk, rank and good" (41:5) commencing in 1670 B.C. till "seven (lunar crescent) thin ears and (black lunar) blasted with the (Milky Way) east wind sprung up (7°) after them" and (lunar open mouth) "devoured" them in 1656 B.C. is 14° years. Clockwise from when Pharaoh "put a gold chain (yellow crescent) about his (Joseph's lunar) neck" (41:42) and "made him (Auriga-Joseph) to ride in the second (Auriga) chariot which he had" (41:43) in 1670 B.C. 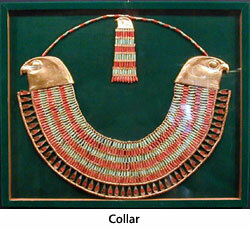 till "seven empty (lunar crescent) ears" (41:27) were fulfilled in 1656 B.C. is 14° years. 41:1 And it came to pass at the end of two full years, that Pharaoh dreamed: and, behold, he (Orion) stood by the river (Eridanus). 2 And, behold, there came up out of the river seven well favoured (Taurus) kine and fatfleshed (seven 360° revolutions of the two-horned moon to Taurus); and they fed in a (green Milky Way) meadow. 3 And, behold, seven other (Taurus) kine came up after them out of the river (Eridanus), ill favoured and leanfleshed (seven 360° revolutions of the two-horned moon to Taurus); and stood by the other kine upon the brink of the river (Eridanus). 4 And the ill favoured and leanfleshed kine did eat up (solar eclipse looks like an open mouth) the seven well favoured and fat kine. So Pharaoh awoke. 5 And he slept and dreamed the second time: and, behold, seven (solar golden) ears of corn (solar grain) came up upon one (yellow radius) stalk, rank and good. 6 And, behold, seven (lunar crescent) thin ears and blasted with the east wind sprung up after them. 7 And the seven (lunar crescent) thin ears devoured (solar eclipse looks like an open mouth) the seven (solar golden) rank and full ears. And Pharaoh awoke, and, behold, it was a dream. 8 And it came to pass in the morning that his spirit was troubled; and he sent and called for all the (Gemini) magicians of Egypt, and all the (Gemini) wise men thereof: and (Orion) Pharaoh told them his dream; but there was none that could interpret them unto Pharaoh. 14 Then (Orion) Pharaoh sent and called (Auriga) Joseph, and they brought him hastily out of the (red radius barred lunar-solar window) dungeon: and he (Orion) (lunar) shaved himself, and changed his raiment, and came in unto (Auriga) Pharaoh. 15 And (Orion) Pharaoh said unto (Auriga) Joseph, I have dreamed a dream, and there is none that can interpret it: and I have heard say of thee, that thou canst understand a dream to interpret it. 16 And (Auriga) Joseph answered (Orion) Pharaoh, saying, It is not in me: God shall give Pharaoh an answer of peace. 24 And the thin ears (years) devoured the seven good ears (years): and I told this unto the (Gemini) magicians; but there was none that could declare it to me. 25 And Joseph (Orion) said unto Pharaoh (Auriga), The dream of Pharaoh is one: God hath shewed Pharaoh what he is about to do. 26 The seven good (Taurus) kine are seven years; and the seven good (solar golden) ears are seven years: the dream is one. 27 And the seven thin and ill favoured (two-horned lunar crescent black) kine that came up after them are seven years; and the seven empty (lunar crescent) ears blasted with the east wind shall be seven years of famine. Josephus relates a dream of Archelaus the son of Herod, who dreamed that he saw ten ears of corn, full and large, devoured by oxen; he sent for the Chaldeans and others to tell him what they signified; one said one thing and another another; at length one Simon, an Essene, said that the ears signified years, and the oxen changes of affairs, because, when they plough up the earth, they turn it up and change it; so that he should reign as many years as were ears of corn seen, and after many changes should die, as he accordingly did (Antiqu. l. 17. c. 15. sect. 3. & de Bello Jud. l. 2. c. 7. sect. 3). Not only a sufficiency but an abundance, even to luxury, as when the Nile rose to sixteen cubits, as Pliny observes (m); which, though a natural cause, was owing to God, and that it should thus overflow for seven years successively, and cause such a continued plenty, can be ascribed to no other. (m) Nat. Hist. l. 5. c. 9.
as, when it did not rise to more than twelve cubits, a famine ensued, as the above writer says ( Nat Hist. l. 5. c. 9). 31 And the plenty shall not be known (eclipsed) in the land by reason of that famine following; for it shall be very grievous. 35 And let them gather all the food of those good years that come, and lay up (solar and lunar golden) corn under the hand of Pharaoh, and let them keep food in the cities. 36 And that food shall be for store to the land against the seven (lunar crescent) years of famine, which shall be in the land of Egypt; that the land perish not through the famine. Justin, an Heathen writer confirms this account of the advice of Joseph, of whom he says, that "he was exceeding sagacious of things wonderful, and first found out the meaning of dreams; and nothing of right, divine or human, seemed unknown to him, so that he could foresee the barrenness of land many years beforehand; and all Egypt would have perished with the famine, if the king, by his advice, had not commanded an edict, that the fruits of the earth, for many years, should be preserved.'' (E. Trogo, l. 36. c. 32). 38 And Pharaoh (Orion) said unto his (Auriga and Gemini) servants, Can we find such a one as this is, a man in whom the Spirit of God is? 40 Thou shalt be over my house, and according unto thy word shall all my (Gemini and Auriga) people be ruled: only in the (lunar crescent) throne will I be greater than thou. 43 And he made him to ride in the second (Auriga) chariot which he had; and they Orion and Auriga) cried before him (Auriga), Bow the knee: and he made him ruler over all the land of Egypt. 45 And Pharaoh called Joseph's name Zaphnathpaaneah (Revealer of Hidden Secrets); and he gave him to wife Asenath the daughter of Potipherah priest of On. And Joseph went out over all the land of Egypt. Joseph's 7 years of plenty and 7 years of famine were from about 1670 till 1656 B.C. since he was age 30 when he stood before Pharaoh at the beginning of this 14-year period (Gen. 41:46) and the Exodus in 1446 B.C. was 430 years after Abraham entered Canaan: "The sojourning of the children of Israel ... was 430 years" till the Exodus (Ex. 12:40-41). Therefore Abraham began sojourning in Canaan and Egypt in 1876 B.C. when he was 75 years old (Gen. 12:4). From Abraham's 75th year till Joseph's 30th year is exactly 206 years (Gen. 16:16; 25:26; 47:9; 41:46-53; 45:6) making that date 1670 B.C. when he stood before Pharaoh. This verse probably contains the brief record of P; according to which Joseph had spent thirteen years in Egypt before his elevation, and was aged seventeen when he was brought into Egypt, Genesis 37:2. There elapsed seven years of plenty and two of the years of famine, before his brothers came down to Egypt (Genesis 45:11). Accordingly, Joseph must have been in Egypt over twenty years before they came. Benjamin had been born some time before Joseph disappeared (Genesis 35:18). Hence, so far from Benjamin being “a little one” (Genesis 44:20), he must have been well over twenty, when Joseph saw his brethren. At this day, at old Cairo, is an edifice the most considerable in it, called Joseph's granary; it occupies a square, surrounded by a wall, and has divers partitions contrived within it, where is deposited the corn, that is paid as a tax to the Gram Seignior, brought from different parts of Egypt (o). (o) Norden's Travels in Egypt, &c. vol. 1. p. 72. 49 And Joseph gathered (solar) corn as the sand of the sea, very much, until he left numbering; for it was without number. 50 And unto Joseph were born two (Gemini) sons before the years of famine came, which Asenath the daughter of Potipherah priest of On bare unto him. 51 And Joseph (Orion) called the name of the firstborn Manasseh (Auriga): For God, said he, hath made me (lunar empty) forget all my toil, and all my father's house. 52 And the name of the second called he (solar Heifer Taurus) Ephraim: For God hath caused me to be fruitful in the land of my affliction. For the Hebrew word to be fruitful, cf. Genesis 28:3, Genesis 35:11, Genesis 48:4. There is a play on the resemblance in the sound of the name to the Hebrew root (prh) meaning “fruitfulness.” The same play on the two words is found in Hosea 13:15, “fruitful among his brethren,” referring to Ephraim. 54 And the seven years of (lunar crescent) dearth began to come, according as Joseph had said: and the dearth was in all lands; but in all the land of Egypt there was (solar golden) bread. It is very probable that to this seven years' drought in Egypt Ovid refers, which he makes to be nine ("Dicitur Aegyptus caruisse juvantibus arva Imbribus, atque annis sicca fuisse novem." -- Ovid de Artc Amandi, l. 1. ver. 647) as does also Apollodorus ( De Deor Orig. l. 2. p. 104). 55 And when all the land of Egypt was famished, the people cried to Pharaoh for (solar golden) bread: and (Orion) Pharaoh (red radius) said unto all the Egyptians, Go unto Joseph; what he saith to you, do. 56 And the (lunar crescent) famine was over all the face of the earth: and (Orion) Joseph opened all the (lunar) storehouses, and sold unto the Egyptians; and the famine waxed sore in the land of Egypt. 57 And all countries came into Egypt to Joseph for to buy (solar) corn; because that the (lunar) famine was so sore in all lands.